This name derives from the Ancient Greek names "Mariám ‎(Μαριάμ) and Maríā ‎(Μαρίᾱ)", found in the New Testament, meaning “bitterness, beloved, wished for child“. 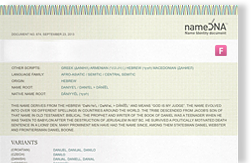 Both New Testament names were forms of the Hebrew name “Maryâm / Miryâm”. The name has been widely used due to its associations with the Virgin Mary, mother of Jesus Christ, and with Saint Mary Magdalene, who was called an apostle to the apostles. The name might be derived from an Egyptian word “Myr” (beloved) or “mr” (love), or even the Ancient Egyptian name “Meritamen” or "Merit-Amun", meaning "beloved of Amun". Mariam or (Arabic: Maryām) form, has been a popular name in predominantly Muslim countries due to the respect given to Mary, mother of Jesus, in Islam. Muslim parents want their daughters to be like Mary in her "chastity and demureness," according to a 2006 IslamOnline.net article.